A few weeks ago, I was dehydrating the end of my delicious summer tomatoes when I discovered I still had some of last year’s dehydrated tomatoes sitting in a jar way toward the back of my pantry. They were still good, but had started to darken and I was sure they had lost much of their flavor. What was I to do with these little lovelies who were past their prime? I pulverized them (literally) into powder! 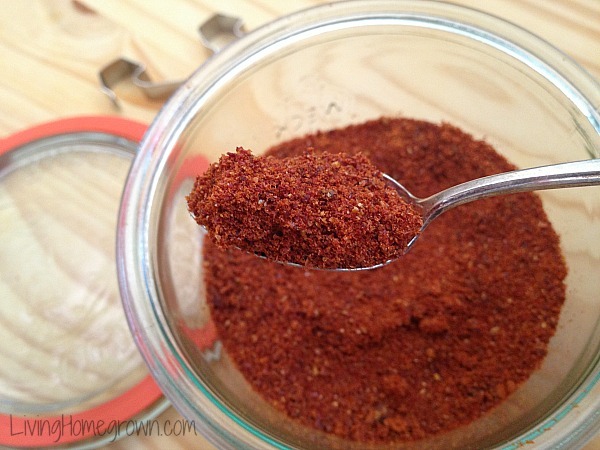 Tomato powder is just a ground up version of dried tomatoes. The result is a super concentrated flavor that can be used in a number of ways. It’s a top-notch flavor enhancer! Last year, I made tomato powder for the very first time and LOVED it. 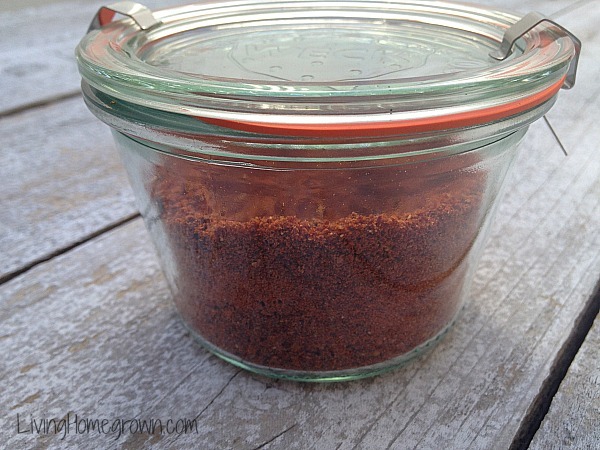 Making tomato powder was the perfect way to give my older dried tomatoes new life. But I also highly recommend you make tomato powder from freshly dried tomatoes as well. You will not believe the flavor and your taste buds will thank you! To make tomato powder, you obviously need dehydrated tomatoes. If you happen to have some on hand already, then you are well on your way to tomato heaven. 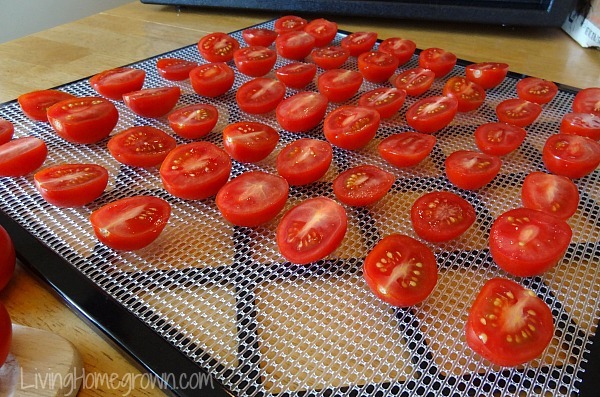 But if not, here are the steps for dehydrating tomatoes in a standard dehydrator. Any dehydrator will do. It does not have to be expensive or fancy. What you get with a more expensive brand is more control over humidity and temperature so that you can dry things much faster. My Excalibur is my workhorse, but you certainly do not need something that fancy to do a good job. Make slices uniform in thickness so they dry evenly. Use firm, ripe tomatoes. Over ripe or overly soft tomatoes are difficult to slice uniformly. 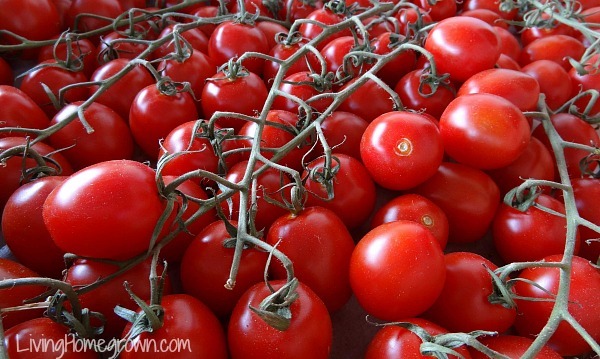 Roma tomatoes are excellent for drying because they are firm, packed with flavor and have low water content. Cherry tomatoes only need to be cut in half. I do not peel or seed my tomatoes for drying. But some people do. 1) Rinse: and dry your tomatoes. 2) Slice: If you are working with large (beefsteak-type) tomatoes, core them and slice them into 1/2-inch slices. Keep your slices as uniform as possible. Smaller tomatoes (like cherry tomatoes) can be cut in half and Roma tomatoes can be sliced into round disks. 5) Timing: This is the tricky part. The amount of time needed is based on the number of tomatoes you are doing, the water content of those tomatoes, the temperature you use, the humidity of the air and the efficiency of the dehydrator you are using. In other words, you have to keep your eye on it. Once you have done this a few times, you will know what works for your situation. It can take anywhere from 4 hours to 15 hours depending upon the factors mentioned. Just check the dehydrator ever few hours and pull completed tomatoes out as you get toward the end. 6) Determining dryness: When completely dry, the tomatoes should feel crisp or hard. They should not feel sticky at all on the surface. 7) Storage: If you are not going to make powder right away, let the tomatoes cool and them store them in an airtight container. (I use a canning jar.) If left for long periods exposed to air, the tomatoes will absorb moisture and will oxidize quickly. Use a high-powered blender (like a Vitamix), a coffee grinder or a food processor to pulverize the dried tomato into a powder. It only takes a few minutes to grind it until it is like a rough-cut grain. Now that you have opened the tomato up to more surface area, it will pop with flavor. But, it will also lose that flavor more quickly. 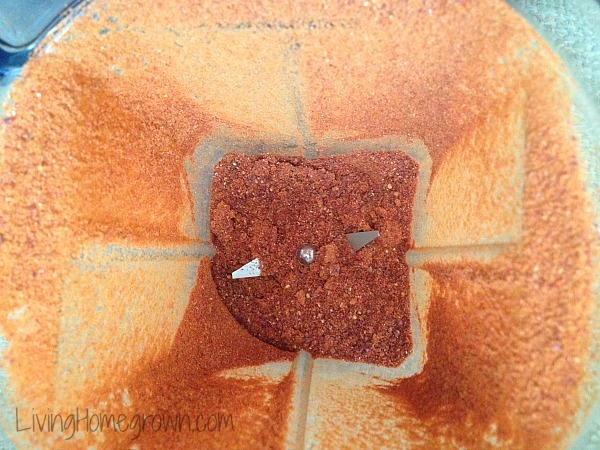 So I recommend doing this in small batches so that you use up what you grind in a month or two. After than, it does not have as much flavor. Tomato powder is extremely concentrated flavor. It can be used as a spice flavoring (sprinkled) or as bigger flavoring (by the spoonful). You can even reconstitute it (with a little warm water) and add it to things like bread. Delicious! I reconstitute it and blend it into homemade bread or spread it over my pizza dough. If so, how will you use it? Tell me in the comments! * Denotes an affiliate link. You are not charged more by using the link, but I get a small portion of the sale which helps pay for blog giveaways. 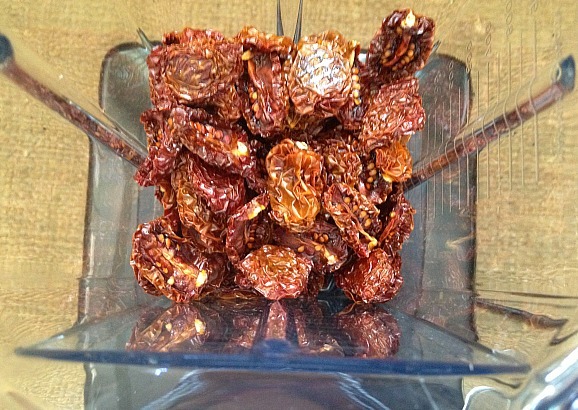 Ooooo – now I know what to do with all of my extra sun-dried tomatoes! I love salsa on my eggs, so I’m betting tomato powder will be amazing, too. Thanks! Looks great…….but one question which exalter dehydrator do you recommend???? Have been looking for a dehydrator for years. I have the Excalibur 3926TB which has 9 trays, the thermostat and a timer. I like having a timer so I can set it and forget for bits of time without worrying about it over processing. But you certainly don’t have to have one. The timers are one of the features that bump up the price. There are 4, 5 and 10 tray units, but I have found the 9 trays are the right amount for me. The size that is right for you would depend upon how much produce you have at a time. I am doing quite a bit of produce and because it is fast, I can fill it, dry and then fill it again. I too have the nine tray and love the timer because I can dry things overnight and have it turn off after eight hours if I need to. It holds a ton of stuff. I also got the liners and make a lot of fruit leather. I have so much winter squash growing right now I might try fruit leather with that…pumpkin pie type??? I just tossed a half of a quart jar of dried tomatoes into my Vita Mix. I plan on using it in pizza sauce and anything that has any tomato in it. I’ll let you know if I come up with something unusual that works. When you add it to pizza sauce are you reconstituting it and making it the pizza sauce or are you adding the powder or reconstituted powder to the already made sauce? When it’s reconstituted is it similar to tomato paste? Thanks! I love new ways to use my garden produce! 1) I will reconstitute it but then add some tomato paste to thicken it up for pizza sauce. (If you let it sit a bit, it does thicken. But it does not get thick enough to my liking so I add the paste.) Then I add herbs and spices for flavor. 2) I take a can of tomato sauce and add some of the powder to give it a more concentrated flavor along with some oregano, garlic and finely chopped onion. I add a little bit of water to a couple of teaspoons to make that 2T. of paste that many recipes call for. Don’t have to open a whole can for such a small amount! Theresa – I cannot believe the timing of this post! 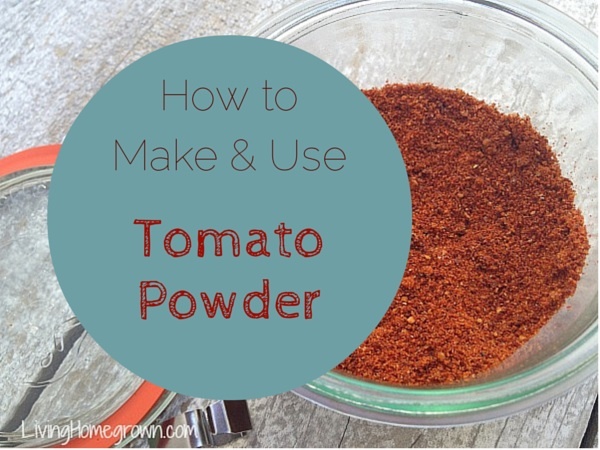 I have been using tomato powder for years – to thicken soups, stews, spaghetti sauce, etc. As DFW stated – it’s great because when you need just a couple of Tbls. of tomato paste, you don’t have to open a whole can. It never occurred to me to try and make my own powder! I have a dehydrator that I’ve never used and I’m going to start today using my end of season Ace tomatoes. Thank you for this post! Love this idea! Have you tried this process with other veges. Not yet…but I think now maybe I should! Fancy that! I just did this a few weeks ago. This is a method that really works well in my busy schedule. It makes preserving the harvest and getting dinner ready soooo much easier. But I puree my tomatoes first, adding a little salt and lemon juice, and then dehydrate on fruit leather liners. I rub a butter wrapper lightly over the tray to keep the leathers from sticking. But really the leather is so brittle when I remove the tomatoes it’s not been an issue. I just crumble and store. And with the resent rains here in Northern Cali I can see an influx of tomatoes in the next few days, all waiting to be preserved in the wee hours of the morning. Have the steam juicer and my son just gave me a nice Breville juicer. The Breville is a very good product but for ease of operation and clear juice the steam is superior. I may be the only person in the world who can taste seeds in the apples but I do notice the difference when I core and peel them before steaming. The pulp can then go right into applesauce and the juice has a “clean” taste. Using a peeler/corer speeds things up and a neat little product called a Rotato can also peel well. Like your site. Thanks Suzanne. Glad you like the site. Hi from Australia. Just stumbled across your site and this post. I have been making fruit, vegie & herb powders for a year now and some of the best ones for giving flavour boosts to food are celery leaf, mushrooms (various types), rocket (argulua), beetroot leaves, kale, onions, garlic, parsley, red capsicum (pepper), strawberries, apples plus many, many more. That is so awesome Roisin. I have never tried anything but tomatoes, but you just gave me a whole new list of delicious possibilities. Thank you! Need to know more about presvering. Thou am from Nigeria. I like to take the extra beans, carrots, beets, cabbage or tomatoes from my garden and dehydrate them. I Grind some into powder, the rest I use for chunk vegetable soups Put in jars, vac seal and then add to soups. Add the tomato powder to water, then add various vegetable powders for a V-8 type drink.. I have a gal bag of Roma tomatoes that I dried (after coring the seeds), hoping to recreate “sun dried” tomatoes which I love for their tanginess. I hadn’t thought about tomato powder but will definitely try this, as I imagine the powder will taste similar to sun dried. I would think the powder would be just great on tossed salads. I haven’t tried it tossed on salads, but I think it would be great that way. And yes, it tastes similar to sun dried. You’ll love it. OMG!!! I have had a dehydrator for years sitting unopened in the pantry. I bought it for drying figs which I have never done. Now I am going to with the rest of my cherry tomatoes that are still on the vine. I’ll let you know how it goes! I’ve been looking all over the Internet for information about storing dried tomatoes and I’m glad I found your page. I started dehydrating 2 years ago, I haven’t done much so I’m still a beginner. Recently, in a bowl I seasoned around 4 lbs of San Marzano tomatoes from my garden with around 1.5 tsp of olive oil and then sprinkled homegrown dried basil and salt on them. I dried the tomatoes with my Presto dehydrator then I put them in a canning jar with a plastic lid. They were at room temperature for 2 days then I refrigerated them. Do I need to refrigerate the dried tomatoes for storage? The tomatoes are oily. I also have mylar bags that I seal with heat, I usually store dried veggies in the bags with oxygen absorbers in my pantry. http://durgan.org/2016/October%202016/10%20October%202016%20Dehydrating%20Non%20stick%20method./HTML/ 10 October 2016 Dehydrating Non stick method. Experimenting with dehydrating plant food it was discovered that dried material sticking to the pan was a major issue particularly in making powder from a slurry. There were various methods available from a perusal of the internet and all were wanting. My experimental method is to add some nixtamalized corn to the slurry. On a few tries the corn separated the slurry on the drying pan and sticking was reduced to a workable minimum. Slurred tomatoes are most prone to sticking to the point that the dried product cannot be removed from the pan without soaking thus voiding the drying purpose. There are probably other material that could be used, but I always have some corn available and it appears to work well also adding some extra nutrients to the mixture. The slurry method is very quick as opposed to slicing material into thin pieces and proceeding in that manner. The dried material is placed in vacuum packages and stored at room temperature. The last of the garden celery for the 2016 season is being made into a powder for preservation. The stalks were cut into small pieces for blending into a slurry with water and 1/2 cup of nixtamalized corn. The corn is used to inhibit the slurry from sticking to the dehydrating pan. Dehydration is about 8 hours at 125F.The dehydrated material is blended into a powder and stored in jars at room temperature. Annotated pictures depict the process. Dehydrating vegetables from a slurry into a powder for storage at room temperature. The vegetables available were onion, sweet potato, tomato, and egg plant.The nixtamalized corn 1/2 cup was added to prevent the slurry from sticking to the pan during dehydration.The material was dehydrated in an Excalibur for about 12 hours. The dried product was blended into a powder and stored in a 250 ml jar for storage at room temperature. Pictures depict the process.